I’ve always had a tenuous relationship with my hair. From the time I was born until I was about two, it wasn’t much more than a reddish peach fuzz on my awkwardly shaped head (my eyes were a little too big for the rest of my head). As I grew older, my father regularly lamented that it was so much like his—limp and lifeless, thin with no body at all. He used to marvel at my sister’s chestnut locks, regularly twisting them into curlers so they fell into plump ringlets. As I grew, my red turned into strawberry blonde hair. Another thing not to like. I didn’t have the brilliant red of my mother, nor was I a true blonde. Kindergarten was difficult—kindergarten teachers like to fit you into categories. There are no strawberry blonde crayons. You either had to choose red or yellow, and I felt like I fit into neither category. When I was eight, my parents decided to take a second honeymoon trip, my dad’s aunt (who was “taking care” of us) decided to give me a perm. I can’t remember the specifics, but I’m sure that I was more than willing to have said perm done. It’s even possible that I suggested it, as I was tired of everyone fawning over my sister’s silken tresses. But home perms in the eighties…well…they weren’t salon masterpieces. Especially if they were done by your sixty-something-year-old great aunt. My mom came home and had a fit. To this day she says she came home to “Little Orphan Annie,” and for a long while after that, I had very short hair. I still had short hair when my parents took me and my sister to Disney in Florida. The stewardess asked my sister if she’d like a Barbie coloring book…and then turned and asked me if I wanted He-Man. My mother instantly decided that I needed to grow my hair again (and I sulked because I wanted He-Man). As likely happens with most teen girls, my hair became my least favorite part of me (after my chicken legs) when I was in my teens. At mom’s suggestion, I did get a salon perm…and then couldn’t wait for it to grow out. Where my sister’s perm just “fell” beautifully on her shoulders in gorgeous silken ringlets, I was told that I’d need to wet, primp, tease and hairspray mine. And I didn’t have it in me. I spent most of that period in brightly colored scrunchies. It really wasn’t until my first pregnancy that I started to appreciate my hair. It started to come in thicker, and, falling just past my shoulders at the time, it felt lovely. I felt lovely. And raidiant. Until the pregnancy ended. And with my depression, I felt deserving of punishment. My hair started to fall out and I did not care. By the time I got pregnant again, I was just starting to upswing. I decided to continue to grow my hair, thankful for another chance. In some way I hoped that my long, stronger hair would mean a longer, stronger pregnancy. A second loss didn’t sway my decision. I don’t know if it “worked”, or it was just meant to be, but one month after Puck was born, I followed through anyway, afraid to tempt fate, like the princess in Rumpelstiltskin. I didn’t have time to care for my hair at the time anyway…and (although no one had told me to expect post-partum hair loss), it was falling out in clumps. It literally felt like a weight was lifted as the hairdresser sliced through my thinning ponytail. I wrote a check and sent it off to a local charity that made wigs for children with cancer. I felt good about my donation – I was helping to make a difference. My hair continued to fall out for an extended period (partly because of the post-partum hair loss, and partly because of stress), but it was easier to manage because it was much shorter. Although my fourth pregnancy was unexpected and a lot more difficult than I could have ever anticipated, I immediately made the same bargain. Less than a month post-partum, my locks were shorn, and I wrote a check. After the accident, I again grew and sheared my hair. This time for a different reason. I was reclaiming myself. I was sealing yet another pact, but this was one that had somehow kept me (and my children) alive. I repaid a debt. And as I became pregnant with Bae, I took up the challenge one more time. This time with a partner. My daughter (six years old at the time), also grew and donated her hair with me. My hair has been with me over forty years now (maybe a couple less if you don’t count the first two…), and I’ve come to enjoy it. My (younger) sister started dyeing hers a few years back, and it takes a lot more work to keep it shiny. Mine has a few strands of sparkle, but for the most part, it’s strong and healthy and thick. And I think I have at least one more in me. (You can’t donate gray hair). What about you my lovelies? Have you ever taken up a cause that not only helped others, but it helped you come to some acceptance of yourself? This post spoke about both compassion for myself and compassion for those struggling through a horrific disease—childhood cancer. I’m linking up with the #1000Speak movement, a group of bloggers who are using the strength of their voices to change the world. 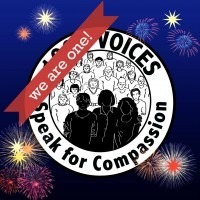 Consider adding your voice to #1000Speak. If you’re moved to donate (either hair or money), please visit your local charity. Locks of Love have several options for donation. Very cool story. I have always had long and thick hair but it will be fully gray probably much sooner than many others, and there’s a darn lot of it to color or cut or whatever I want to do. I think I’m just going to let it go naturally…who can be bothered with all the trouble of coloring it…(not me, for sure). Love the post, Liv! Yep, I donated my hair to charity last year–I had to just cut it all off. For me it had to do with cutting out the craziness of the divorce and starting anew. my now hubby, who love(s) my long hair, did have words and thoughts and opinions on it, but I just needed to chop it. It’s growing back, and i like to think it’s including all our new life experiences in it. Yes – it’s like refreshing yourself and leaving that part of you behind. A perfect way to think of it! That’s very cool. I think I donated hair once when I was a kid. It’s far too short to donate now, and it’s staying that way. Bummer that you didn’t get He-Man! I can’t even imagine you with long hair, but that’s awesome you did it! And right? Geez. Who wants barbie?? I have participated in multiple charities and it always has the added boost of making me feel better about myself. It’s great when you can feel good about helping others! Mine has to be about hair too but not my crown on my head but on my body. I never appreciated it and waxed and shaved it off. Now I realise how wrong I was. Though body hair is not a norm but I’m keeping mine!